It’s that time again. Time to look for a ton of Sesame Street toys to appease my Elmo-loving toddler. Last year, we went crazy with the Sesame Street paraphernalia. Some of it is still available this year, so it’s time to give you a review before you buy it for yourself. A last minute, spur of the moment purchase was the Sesame Street Hide and Seek Pals Review. At first, Norton wasn’t terribly interested in the toy. I was glad; the toy got on my nerves. Well, it’s a pretty simple little thing that is exactly like it sounds. You’ve got four windows on 123 Sesame Street. When you pull the lever, the characters rotate behind the shuttered windows. Elmo then tells you to find one of the characters or to open a particular colored door. Rather than telling you that you did or didn’t open the right one, it just tells you which one you actually opened (or which Muppet you actually found). It encourages fine motor skills by teaching the child how to manipulate the different window levers and closing them back. The toy will also teach colors and numbers by asking the child to open the particular window. Ultimately, Norton did become interested in the toy a few months after Christmas. He does enjoy hearing his favorite characters talk to him, and he’s always been fascinated with opening and closing things. Do I still find it annoying? Yup. Thankfully, that’s a toy that Norton plays with mainly in his bedroom. On the plus side, it’s also quite durable. It’s held up with absolutely no problems. The sounds work, the batteries keep charged, and Norton still enjoys it. 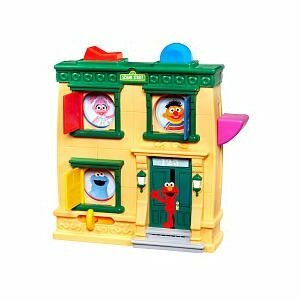 Do you have the Sesame Street Hide and Seek Pals toy? Would you recommend it to a friend? That is so cute, I think my little nieces and nephews would love this! My daughter’s pre-k class had this as a toy. She really liked it. My daughter has grown out of the Sesame Street phase (she’s almost 8) but her toddler-aged cousins would absolutely love this!